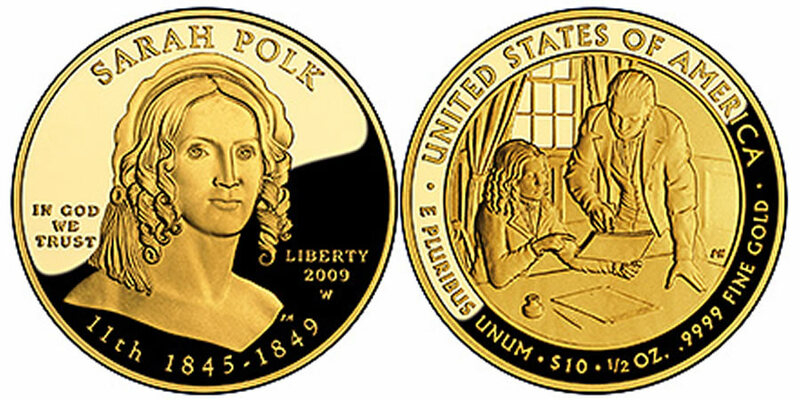 The Sarah Polk First Spouse Gold Coin in proof condition is the twelfth coin available in the First Spouse series from the US Mint. Available September 3, 2009, the coins are struck from 24 carat gold. Sarah received an excellent education as a child and was more than prepared to meet the challenges associated with being the wife of a prominent politician. She married James Polk in 1824 and soon they were on their way to Washington D.C. where he served several terms to the United States House of Representatives. After a term as Governor of Tennessee, James and Sarah once again set their sites on Washington. With initial hopes of becoming the Vice President, the Polks were surprised to find James had won the Presidency. Sarah was a strong supporter of her husband and was well versed in all his affairs. In fact, she served as his private secretary, the only first lady to do so. Sarah also pre-read newspapers and correspondence for the President, highlighting areas of importance. Also available is the Sarah Polk Coin uncirculated version. Designed and sculpted by Phebe Hemphill, the obverse contains a portrait of Sarah Polk. Also inscribed are the words "SARAH POLK ", "IN GOD WE TRUST", "LIBERTY", "2009", "11th 1845-1849", and the mintmark "W". The reverse was also designed and sculpted by Phebe Hemphill. It shows Sarah sitting at a desk with her husband, President James Polk, beside her working in the White House. Included as well are the words "UNITED STATES OF AMERICA", "E PLURIBUS UNUM", "$10", "1/2 OZ. ", and ".9999 PURE GOLD".